I tried a couple recipes this week and, bad blogger that I am, forgot to take pictures. The first was Tomato Alphabet Soup with Parmesan Crisps from Every Day with Rachael Ray. I wish I would have done the crisps in two batches because the ones on the bottom of the rolling pin ended up sorta soggy. It was the perfect soup for cold weather and even Darcy loved it (especially with some little toast dippers). The second recipe I made without taking a picture (can you tell I'm beating myself up about this?) was Austin Mac 'n' Cheese Suiza. Holy cow was it ever good. A lot of work and pans were used in the creation of this recipe, but it was worth it. My Central Jersey has a report from Rachael's book signing in New Jersey last week. Elliek features a review of Rachael's Turkey Noodle Casserole. Jessica at Johnstone's Vin Blanc made Roasted Butternut Squash Penne with Autumn Pesto. TV Squad's Bob Sassone weighs in on whether the Rachael Ray v. Martha Stewart feud is real. 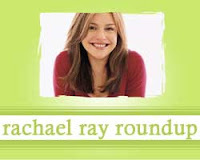 Partysugar offers a timely review of a recipe for Bourbon-Glazed Spiced Rubbed Turkey from Every Day with Rachael Ray.